As a tea aficionado who consumes several mugs a day, I tend to be very particular about my brand. Finding good tea in the United States is difficult. 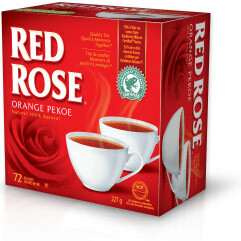 They aren’t as particular as we Canadians are and their brands pale by comparison so I always take my own Red Rose tea bags when I go south. My tea-buddy Terry and I always take our own bags when visiting friends who are coffee drinkers and don’t understand our tastes. I remember my friend Gail telling me about her 11-year-old grandson visiting her and asking for a cup of tea. After taking one sip, he screwed up his face and muttered, “it’s not Red Rose.” Gotta love a kid with good taste.